Mommy and her friend Carrie walked the Race for the Cure, for breast cancer. (It was a very early morning.) The boys were still sound asleep, when she left the house. They boys spent the morning with grandma! When Mommy came home, this is what she found...Mikey looking for "dirt," in the rock garden. 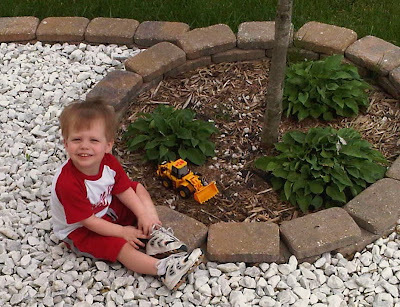 He was playing in the tree mulch,with his tractor, happy as could be! Ryan is 3 Months Old!